The MLS playoffs are in full swing. MLS equals Major League Soccer. Heard of it? Soccer may be the world's sport, but not in the USA. Still there are signs that the sport is starting to attract some fans. Tonight at the Home Depot Center near Los Angeles, there will be some very passionate ones on hand to watch team Chivas USA take on Real Salt Lake. Most Chivas fans are Mexican-American - the club had a long history in Mexico before joining MLS - but the team has struggled to find its identity in the United States. It even has two rival fan clubs. Rival fans clubs? Weekend America's Charlie Schroeder explains. Chivas USA has two fan clubs. One is called "Legion 1908." They occupy the seats behind the north goal, wear Chivas jerseys and sing songs. The other fan club is called "Union Ultras." They occupy the seats behind the south goal and also wear Chivas jerseys and sing songs. To the casual observer, there's not much difference between these two fan clubs. They're both passionate supporters and they both stand and sing for the entire game. What's most surprising is their dislike for each other. After all, isn't the conflict at sporting events supposed to take place on the field between opposing teams, not between fan clubs of the same team? When I asked the Legion member "Cheyo" why the Legions and Ultras were in a standoff, he wasn't exactly forthcoming with the details. "I don't want to comment on that," he said. "Honestly, it's something we don't talk about because they don't exist to us. The less we acknowledge them the better we're off and the better they're off." Turns out, tradition is at heart of this conflict. And it requires a little back story about Chivas USA's big brother, Chivas Guadalajara, to understand the disagreement between the Union Utlras and Legion 1908. Chivas Guadalajara players are all Mexican natives. That makes them the most popular soccer club in Mexico. A few years ago Chivas Guadalajara decided to expand and join the U.S. professional soccer league, MLS. Their team here is called "Chivas USA" and they play just outside Los Angeles at the Home Depot Center. But Chivas USA is different from Chivas Guadalajara. Chivas USA's players come from everywhere: Cuba, Switzerland and the United States, among many others. But that doesn't matter to the Legion 1908, a worldwide fan club devoted to Chivas Guadalajara. With Chivas USA in Los Angeles, their local branch ("Legion Kalifas") can go to games and be in the presence of something truly Mexican: The Chivas colors. Not skin colors, but the familiar Chivas jersey with its red and white stripes. Legion member Ralph Vellasios was born in the U.S., but he tells me that being at a Chivas USA game is the next best thing to being in Mexico. "We love the colors, we follow the teams religiously," he explains. "We're trying to bring those traditions over here to the U.S."
Some of those traditions include throwing streamers and confetti. Legion members also play drums and sing songs in Spanish about Chivas Guadalajara's Mexican archrivals, even at Chivas USA games where they're playing American teams. Another Legion member, Jesse, tells me these traditions help define who he is - a Mexican trying to keep his culture alive in America. "On the Fourth of July we have carne asada, we don't have hotdogs and hamburgers," says Jesse. "Come Christmas time, we have tamales, we don't have turkey and ham. So it's a little different." And come time to support Chivas USA, Jesse will sing songs in Spanish. But earlier this year, that tradition started to bother a few Legion members. They wanted to sing songs specifically about Chivas USA. And they wanted to sing in Spanish and English. So as Richard Escutia tells me, they broke with tradition and formed another fan club, the Union Ultras. "Our chants are in English and Spanish, hoping to lure some of the Anglo fans," Escutia tells me. "Now they're getting to trust us, and it's a matter of time before they join us too." For Richard, starting the Union Ultras meant bending tradition. For another Ultras member, a man named Julio, it meant finding a more hospitable cheering environment. "I was a former Legion member," Julio says. Julio switched sides because, according to him, Legion members "were always throwing beer on you and smoking weed in front of all the little kids." The Legion is a brotherhood. Their initiation is violent and involves being beaten up by other members. So it's not surprising that they tried to pick a fight with the Ultras. They even wrote a song about them. 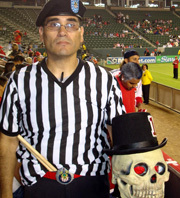 Finally the Legion member "Profe" tells me, Chivas' main office intervened. "They told us to stop it," says Profe. "We said, you're right, we will stop. Because they don't matter." This season the Legion has gone from being aggressive toward the Ultras to being passive-aggressive. When I tell Ultras member Nemeius what the Legion thinks of them, I'm not surprised that his take is diplomatic. "You know what, if it's two supporters supporting the same team, we'll take care of one side, they'll take care of the other side." And tonight, both fan clubs hope Chivas USA will take care of what's in between. La Legion 1908 son verdaderos hinchas y todos saben quien es la Banda Del Centenario. Me dan risa los que dicen que son de la irre y la legion. En Mexico, estos grupos no se hablan y aqui andan juntos de la mano. ja ja ja. Somos el futuro de CHIVAS USA. Puro IRRE....que mamadas son esas..ke ultras mis huevos. AWT GOR2 DEL TABLON Y NADIE MAS!